I’ve been a fan of Steak ‘n Shake since the earliest days of the blog, and their seasonal Oktoberfest Steakburger is among my favorite fast food burgers on the market. They’re pretty reliable when it comes to providing me with new and interesting burgers to try, and they’ve outdone themselves again with the Pepperoni Pizza Steakburger, an attempt to combine both pizza and burgers into a single gesalt pleasure. Well, let’s get to it! I know a ton of people who get pedantic about what is and isn’t a sandwich, or a pizza, or BBQ or what have you. Just enjoy the crazy food times we live in. 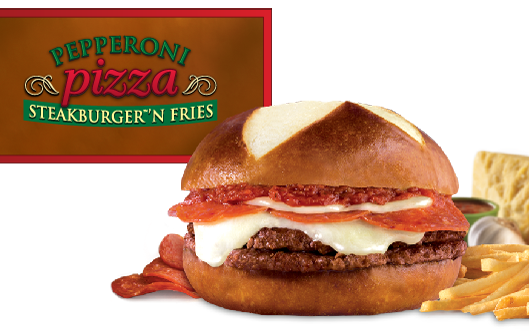 The Pepperoni Pizza Steakburger is pretty obvious, in design. It’s two patties topped with mozzarella cheese, pizza sauce and pepperoni slices, and then served on a pretzel bun. It’s a nice idea, and executed decently well. The pepperoni is pretty good, and there’s plenty of cheese and sauce. It’s a little greasy, so the pretzel bun is a nice choice to help soak up excess grease. It’s also kind of heavy, with all the meat and cheese, so make sure you have a big appetite. The Pepperoni Pizza Steakburger runs for about $5.50 with fries and a drink. I haven’t had a ton to say about it because it’s pretty average, overall. If you came up with this in your house, it would be the coolest thing you ever made, but as a restaurant offering, it’s inexplicably a little lackluster. Still, I’ve ordered it more than once, so I guess I enjoy it, so I’ll give it a recommendation.